When I first went to college, I had no idea what I needed to bring. 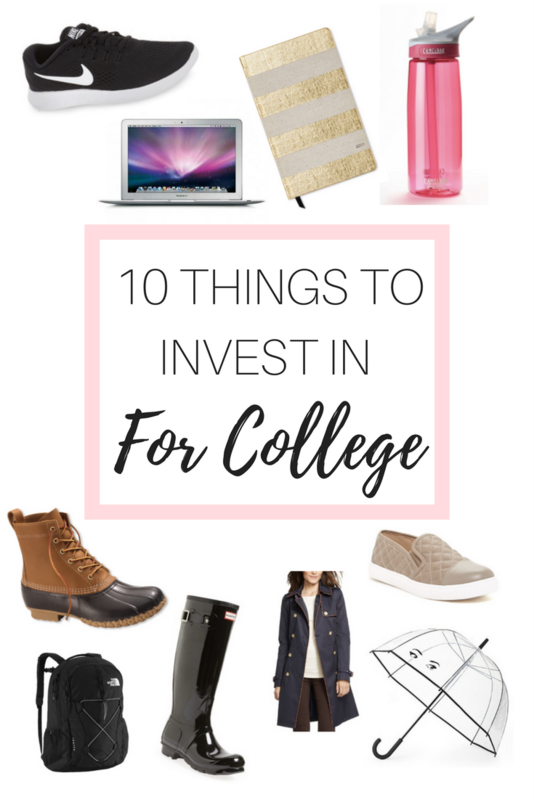 While I already have a post about what you need to pack for college, I wanted to share 10 items that are really worth investing in for college. I use all these items ALL the time and it's definitely worth shelling out a bit of money to ensure that you have everything you're going to need! Although, not all these items are expensive, so don't worry! Having an amazing pair of sneakers is an absolute necessity in college. I feel like I practically live in sneakers because they're so comfortable and they're easy to throw on when you're running out to class. While I like to look cute for class, most days I find myself throwing on leggings and a sweatshirt (or tee-shirt when it's warm out) and heading off. I love these sneakers, but anything from Nike is usually super comfortable. I would definitely recommend getting ones that are really comfortable and really cute at the same time! This isn't really what I would call a huge "investment," but it's definitely worth purchasing a really nice, insulated water bottle for college. This is much better than purchasing plastic water bottles over and over again. Plus, reusable water bottles are good for the environment! You'll be so glad you have this when you suddenly realize you wouldn't be drinking enough water without it. I feel like I'm always raving about planners, but they're honestly a total life saver in college. I have no idea what I would do without my planner. It really helps to get all those assignments, due dates, and projects out of your head and onto paper. If you don't already have a good laptop by the time you head off to college, you absolutely need one. I know a lot of students have laptops in high school, so just make sure your laptop is in great condition and is going to continue working throughout the semester. A lot of colleges provide you with the opportunity to purchase your laptop through the school with a discounted rate! Bubble umbrellas are LIFE in college. Somehow, I feel like it's always raining at school. Bubble umbrellas are awesome because they come down a bit farther than regular umbrella so if it's windy, you don't have to worry about getting hit in the face with the rain! Along with a bubble umbrella, you should definitely invest in a nice raincoat. This will come in super handy. I feel like raincoats weren't as important in high school because you would just have to walk from the parking lot to the building, and then you were cozy inside for the rest of the day. In college, you'll have to walk from your building to your class buildings, and you'll find yourself walking all over campus on a daily basis. You'll want a nice raincoat for the days that it's down-pouring! Now, depending on where you go to school, this one may not really apply to you. If you do, however, go to school somewhere where it snows, you'll want some snow boots. I remember when I was a kid snow boots were always the ugliest things ever, but now I feel like they have some super cute ones. I actually don't mind winter because I have the cutest winter gear ever! These ones are my favorite winter boots, and they're incredibly durable while also looking adorable. No matter where you go to school, a pair of rain boots is a necessity. I'm obsessed with these rain boots, and I have them in the glossy navy shade. These have come in so handy the past two years in college, so I would definitely recommend investing in a pair for school. I have both a backpack and a school bag for college. I find it nice to have a backpack if I need to take a lot of stuff around with me, but some days it's nice to have just a bag to carry a few things in for class. It's completely up to you if you want to just purchase one or the other (or both!). Either way, you obviously need some sort of bag to carry around your things in. It's important to get a nice one so that it doesn't start falling apart from all the daily wear and tear. You'll be doing a lot of walking at college, so it's important to have a go-to pair of shoes that you can wear. I love these slip-on shoes because they're super comfortable and easy to throw on when you're quickly running out the door to class. Is there anything missing on this list? 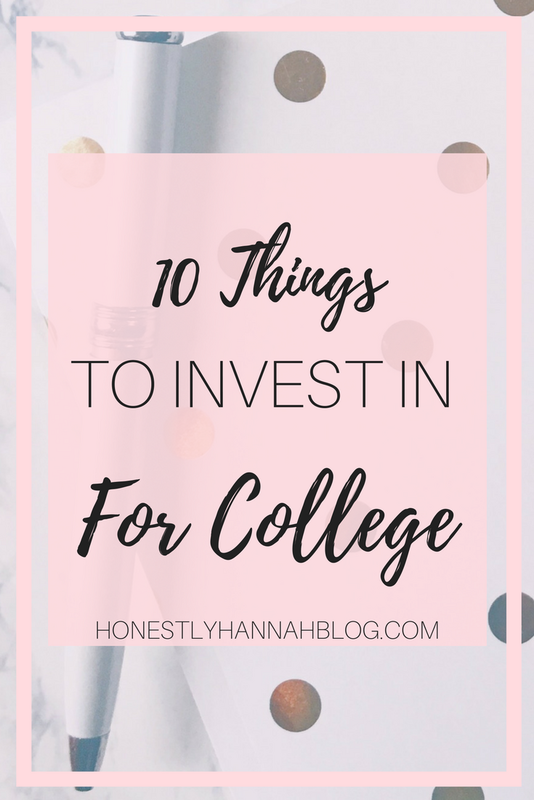 Let me know in the comments what you think is worth investing in for college! I feel like a raincoat in general is something everybody needs! I can't thank my mum enough for convincing me to get one! A raincoat is definitely a must have! Couldn't live without mine at college!